The National Week of Deaf People officially kicked off yesterday, celebrating the language, culture and history of deaf individuals and the deaf Australian community. However, did you know that just like humans, dogs or cats can be born deaf? They can also develop deafness over time, due to hereditary or degenerative factors, as well as diseases of the inner ear. 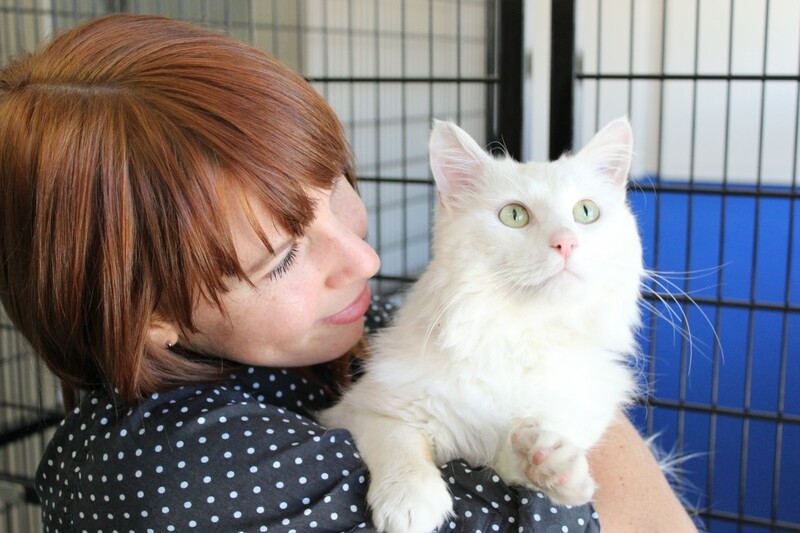 White cats are often deaf from birth due to their genetics, particularly those with blue eyes. The condition is associated with their blue irises and white cats with mixed-coloured eyes are often found to be deaf only on the blue-eyed side. Deaf cats will generally cope quite well, but it’s important to help your pet avoid potential hazards. First and foremost, we recommend that they should be kept as indoor cats wherever possible. It is also ideal that they are the only pet, so that they are not stressed or harassed by other animals. Avoid situations that could be dangerous. For example, don’t allow your cat to roam outside, near lawnmowers or barking dogs. Replace voice commands with hand signals. If your cat is outside during the day, use a torch to bring them in at night. Encourage your cat to make eye contact with you by offering them a treat whenever they do. Use vibration, such as stomping your foot or clapping your hands, so they know you are nearby. Keep your cat away from unknown animals. A deaf cat won’t be able to hear their hissing or threats. Attach a tag to their collar with your contact number and a small note that says, “I am deaf”. And, if you can, confine your cat inside or in a fenced garden. If you are concerned that your cat may be having trouble hearing, observe how they react to sounds. Cats will normally turn their head in the direction of a sound, moving their ears around to locate the exact position of the noise. If your cat doesn’t do this then they may have hearing troubles. It is, however, best to always best to take a trip to your vet to get informed advice on your cat’s condition. If you’re concerned about your cat’s hearing, contact The Frank Samways Veterinary Clinic today. The clinic has extended hours from Monday to Friday and is open on the weekend too. To find out more, simple call 9329 2755 or visit the clinic at 1 Boundary Road, North Melbourne. Jeff is super happy-go-lucky sort of character who is always positive and read ready for affection and cuddle time. He loves a good scratch behind the ear and a pat. Jeff will need an owner who is happy to keep him as an indoor cat, because he is deaf, which makes him vulnerable to cars and dogs. His fair coat also means he is predisposed to skin cancer and therefore best kept indoors.